This reminds me of a song from when i was, like, 3 by Raffi.......baby beluga.......something something something.......I don't remember the words! ah well. it's a good memory. they're adorable! AWESOME!!! I love whales... they are so clever. Go Mia! Baby beluga in the deep blue sea! Swim so wild and you swim so free! Heaven above and the sea below! And a little white whale on the go! Yay! Go Belugas!!! How greatful she must be! That story is touching and beautiful. you know some peeps dont believe animals have souls. and for those people: haha take this! This is proof that animals DO have souls. they show compassion for other animals. You would think only things with souls can do that. AWW AWW AWWWWwwWWwwwWw! Yay! 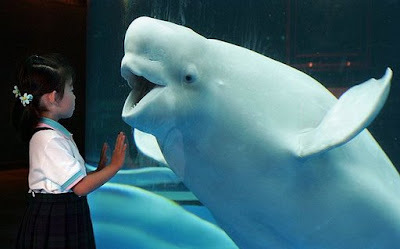 I luffle belugas. They're so adorable and playful... Oh, and animals totally have souls. That's just a no-brainer. We went to the aquarium a few days ago and saw some beluga wales. Hey peoplez!! I need your help. Unfortunately, I go back to prison... I mean school, on the 24th and I need a backpack. I want something cool and unique and edgy but all I seem to find are hot pink ones advertising barbie or hello kitty or the disney princesses! I need help!!!!!! Yes! "Baby Beluga" by Raffi...the guy with the banana in his ear! They ARE super cute! yeah belugas! What about these . . . If i had a fish tank big enough i would soooo get one! chanel should go to a vans store. they have awsome backpacks.